Note: Some models shown below may not be currently in stock. The most versatile touring kayak ever created is in a category of its own. This day or weekend tripper is a performance machine with great acceleration and speed. is perfect for new paddlers, while the experienced will appreciate its speed and agility. plus added storage space for longer distances or extended weekend camping. Want more control on windy days? Go with the rudder option. 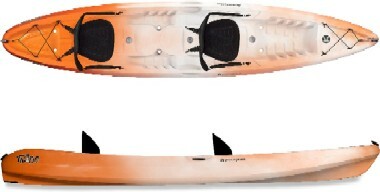 for an afternoon paddle, the all new Expression 11.5 is the ideal answer. builds confidence and skill, an ideal stepping stone into the world of touring. phone and capture and share your best on-water moments. fun for even new paddlers to explore lakes, ponds, and flat-water rivers. Designed to be the best all-around boats for the money. Ready to fish right out of the box. The Pescador is loaded with features. A kayak for the KIDS ! Perfect choice for smaller paddlers. Rich options at an affordable price. and bow deck bungee to keep important items secure and close at hand. Ideal for many types of water, from lakes to slow, deep rivers. The no-hassle size is easy to throw on a car and to store. 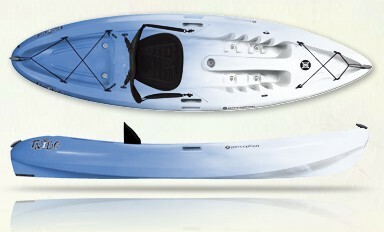 most comfortable and best performing kayaks in its class. but is also speedy and maneuverable on flat water and lazy rivers. with the body rather than at an awkward angle. Three's company in the Tribe 13.5 tandem. lazy rivers. It's the complete package of speed, control, and comfort. Paddling solo is also no problem from the center seat. The Tribute is engineered specifically for women and smaller paddlers. and smooth handling in an exceptionally stable design.